The Radeon RX Vega M GH will be on par with the GTX 1060 Max-Q in a chassis that's a fraction of the size of a laptop. Its 230 W power supply and 100 W CPU, however, have our heads scratching about heat dissipation and fan noise in such a small design. 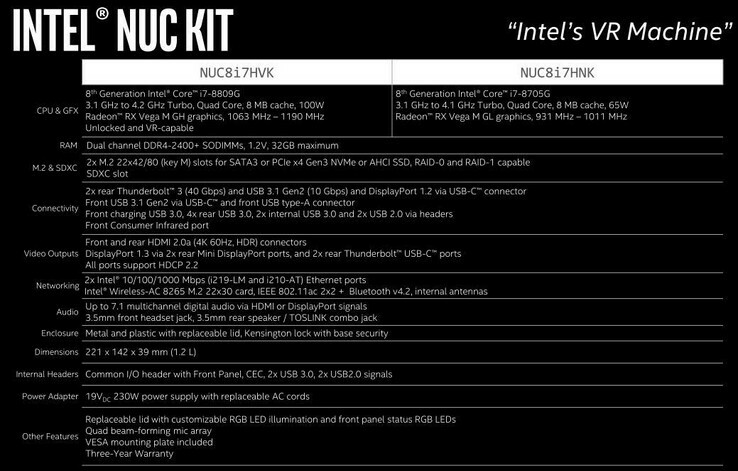 The current Intel NUC Skull Canyon will finally have a proper successor and it's looking like it will be quite the upgrade. Our comparison table below outlines some of the key differences between the outgoing NUC Skull Canyon and incoming NUC Hades Canyon. The most notable difference, of course, will be the two-generation leap from the Skylake i7-6770HQ to the Kaby Lake-G series. The higher-end NUC8i7HVK SKU will come equipped with an unlocked 100 W Core i7-8809G CPU with integrated Radeon RX Vega GH graphics while the less powerful NUK8i7HNK SKU will come with a 65 W Core i7-8705G CPU with integrated Radeon RX Vega M GL graphics. The announcement of the two NUC Hades Canyon configurations coincides with the official unveiling of the Kaby Lake-G series of processors that we will preview very shortly. Consequently, the mini PC will be the premier showcase for Intel's Kaby Lake-G once it launches this Spring. 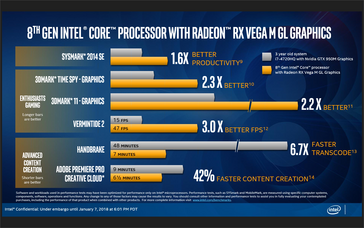 The graphical performance gap between the Iris Pro Graphics 580 and Radeon RX Vega M can't be understated. 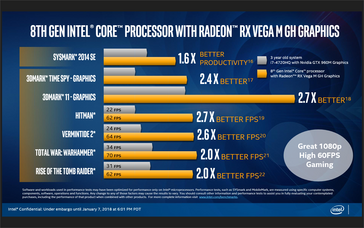 As mentioned by Intel, the Radeon RX Vega M GH in the higher-end NUC8i7HVK SKU is essentially equivalent to the GeForce GTX 1060 Max-Q in synthetic benchmarks. 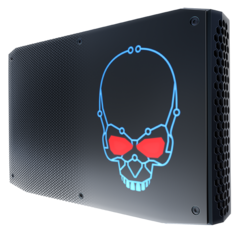 Since the Iris Pro Graphics 580 is roughly comparable to the GTX 950M, we can deduce a gaming performance boost of about 3x if upgrading from the NUC Skull Canyon. 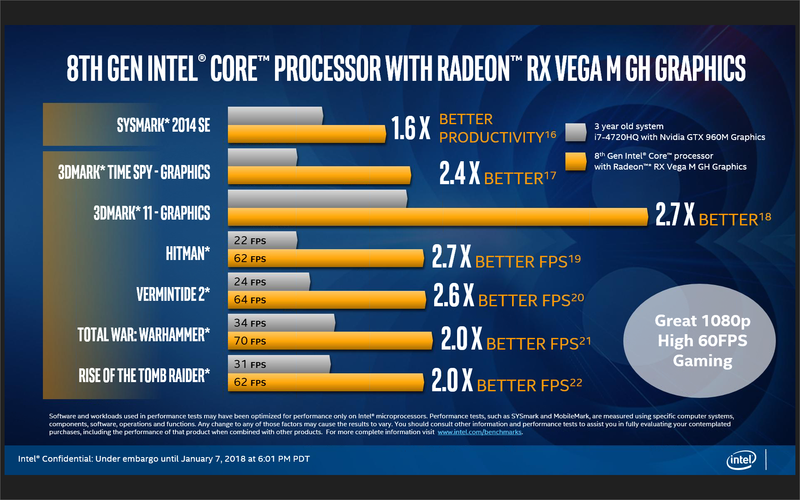 Even the Radeon RX Vega M GL in the lower-end NUC8i7HNK SKU is purportedly about 30 percent faster than the GTX 1050. Although these Intel-provided numbers have likely been nudged a bit, the ballpark figures do line up with a rumor late last year claiming that the then unannounced i7-8809G and i7-8705G were performing similarly to the GTX 1050 in the Ashes of the Singularity benchmark test. Beyond the CPU and GPU, the NUC design has received a major overhaul. Many of the ports have been doubled including Thunderbolt 3, HDMI, RJ-45, and mDP for an even wider range of connectivity options. Physical slots for internal RAM and storage remain identical as does the familiar removable skull plate on the top of the unit. Our main concerns for the NUC Hades Canyon are its temperature development and fan noise. The chassis is 39 percent thicker, 22 percent wider, and potentially 2x more demanding than the last generation NUC because of its external 230 W AC adapter. 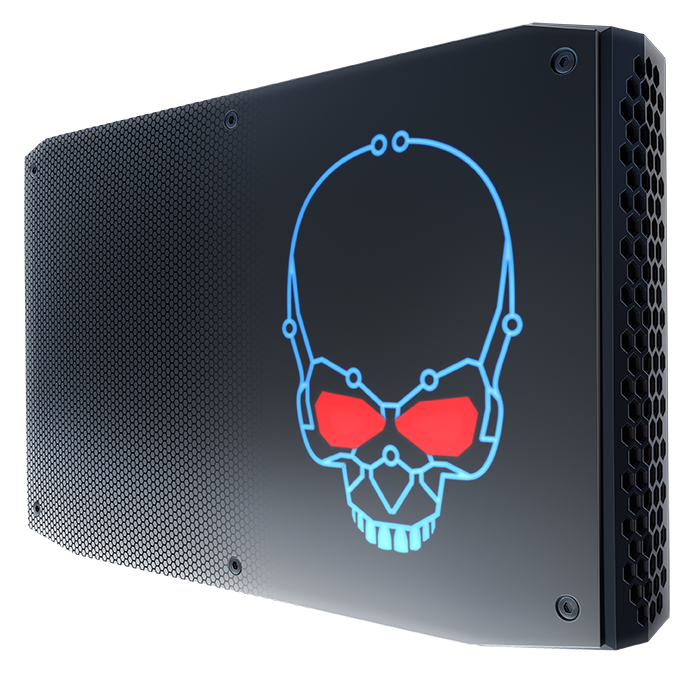 As detailed in our review of the NUC Skull Canyon, core temperatures can be very high at 80 C when gaming or even 97 C when under 100 percent utilization with fan noise as loud as 43 dB(A). Exactly how the NUC Hades Canyon will cope with an even more demanding 65 W or 100 W CPU remains to be seen, but we suspect that the fatter chassis will contribute to a (hopefully) beefier cooling solution. Lastly, driver support will be another potential wildcard. The Intel Iris series has never been optimal for gaming and AMD has had a colorful history with its Radeon drivers to say the least. 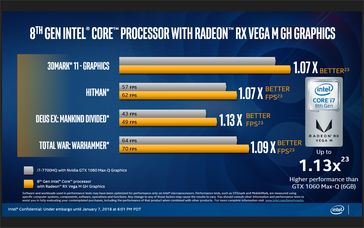 Nonetheless, Intel has reiterated that it - and not AMD - will be responsible for the graphics drivers as part of its Kaby Lake-G series. 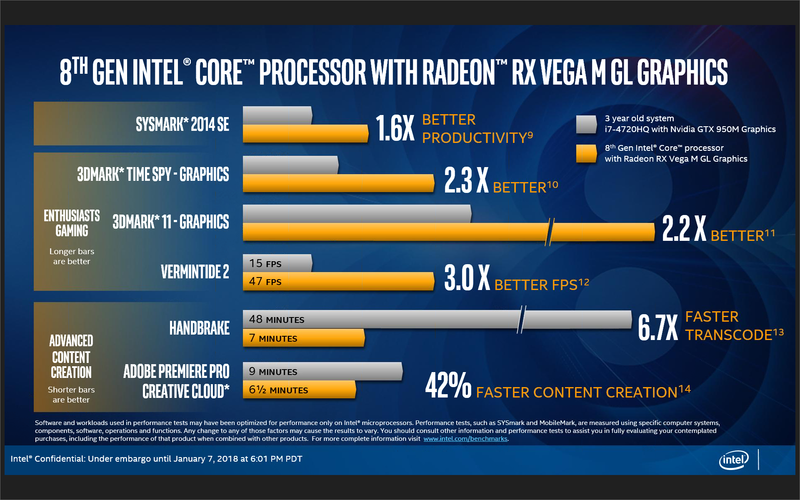 We can only hope that its Dynamic Tuning and Power Sharing platform can maximize CPU and GPU performance instead of throttling one or the other whilst gaming. 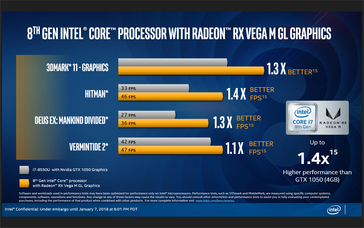 Note that the integrated HD Graphics 630 will remain active within the processor for video decoding and other low-power tasks but will otherwise operate independently from the Radeon GPU when gaming. 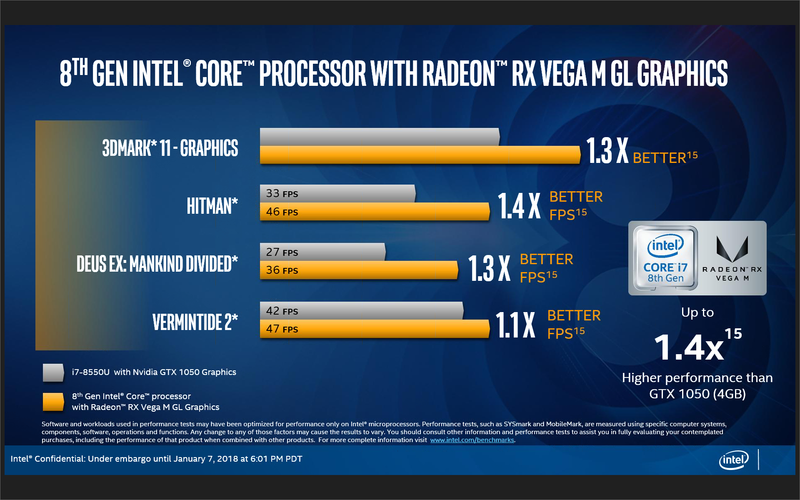 Thus, it is very unlikely that Intel will offer quasi-Dual Graphics support between the Radeon GPU and Intel GPU to improve frame rates. Prices have yet to be announced for the NUC Hades Canyon. Expect another full review on the NUC once we are closer to its launch window. The Intel NUC series competes directly against other mini PCs including the Zotac ZBox, Gigabyte Brix and MSI Trident.